Cryptocurrency is very popular on the social discussion platform, Reddit. 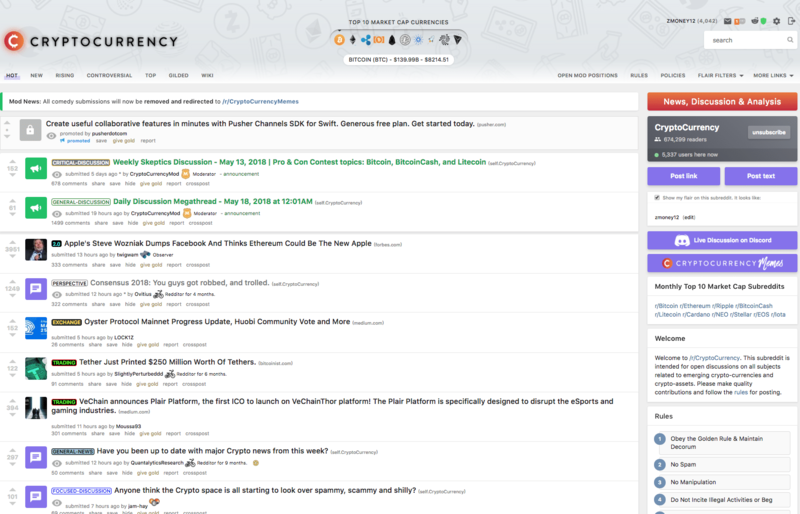 The subreddit /r/Cryptocurrency is a popular place to share and discuss all cryptocurrency related topics & breaking news with large groups of readers in one place. Currently the cryptocurrency sub-reddit is home to 650k+ subscribed readers and is active daily. Brave Ads (BAT) officially released: Users can now receive BAT token rewards for seeing ads in Brave (desktop)! First advertising partners also announced. I traveled 1 year around the world on 1 BTC (and alts) -- and wrote a book about it. We would like to inform the community that Waltonchain’s Fully Operational Mainnet was officially released today, at 20:35:22 on April 24, 2019. (UTC+8) The brand new era of Waltonchain has just begun! Sign up for crypto updates delivered to your inbox.